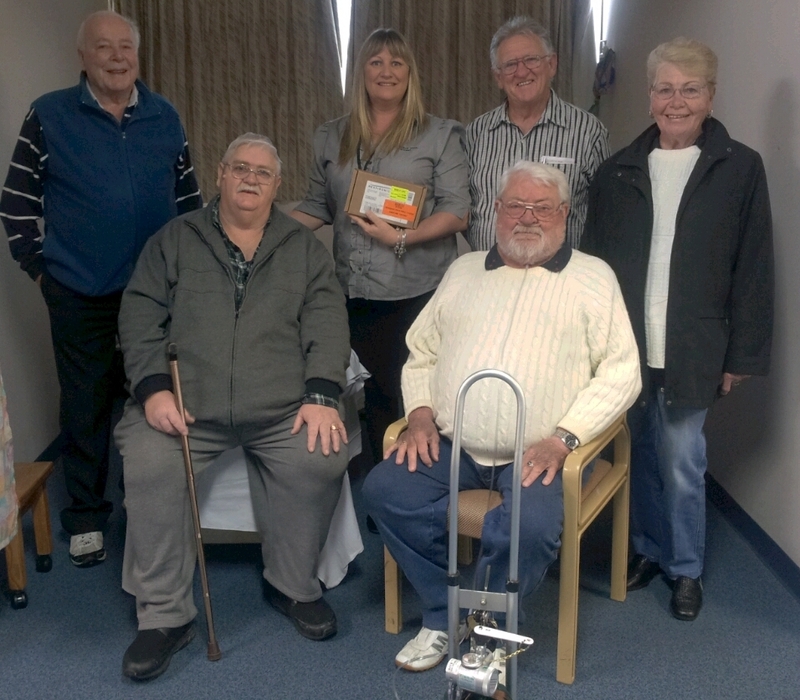 The Millicent Respiratory Support Group (MRSG) held two wood raffles this year to raise funds to purchase a spare battery for a portable oxygen concentrator and a walking machine. Both items assist members of the community who suffer with respiratory conditions. The Millicent Respiratory Support Group presented the Community with a Portable Oxygen Concentrator at a handover ceremony at the Medical Clinic Millicent in December of last year 2013. The group became aware of the difficulties some community members were having, when visiting specialists away from home; having to rely on their heavier more cumbersome oxygen bottles. The Portable Oxygen Concentrator will be loaned to patients under the care of a Respiratory Nurse and Doctor and will be arranged through the Medical Clinic Millicent. Today’s presentation of a spare battery will be a beneficial addition to patients travelling distances to attend appointments in the city. Julie Walker accepted the battery on behalf of the Medical Clinic Millicent from President of the MRSG. Physiotherpist Lydia Chiodze and Assistant Physiotherapist Wendy Kuhlmann accepted the new walking machine which is on loan to the Millicent Hospital physio centre from the MRSG. It will be used in conjunction with the specialized eight (8) week program designed to assist patients with respiratory problems build up lung capacity and overall stamina. The program is designed to help keep patients in the best health possible and also to help keep them out of hospital. Ms Kuhlmann said they love their work in Millicent because the Millicent community is a very supportive one and she thanked the MRSG for their generous help in providing equipment for their patients at the hospital. Presidents of MRSG Tom Briggs and Lance Evans attended the presentation arranged by Secretary Colin Pye. All said they had sat for many hours selling raffle tickets to fundraise and thanked the generous people of their community for supporting their raffles. Categories: General News, Millicent, Wattle Range | Tags: Millicent Respiratory Support Group | Permalink. Thanks Sheryl for a beautifully worded report.